For some of us, the prospect of carpet cleaning on a regular basis just sounds like too much of an effort. A lot of the time we look on in envy at others who have managed to integrate hardwood floors with their preferred interior design features. However, you shouldn’t just think that having wooden flooring gets rid of all the cleaning requirements you’d usually have to face with carpets. In fact, there are plenty of other cleaning methods you’ll need to get used to if you decide to go for hardwood flooring. Here are some of the cleaning techniques you shouldn’t carry over from your time with carpets once you finally decide to go with wooden flooring. It’s time to throw away the standard household cleaning products you’d usually associate with carpets. 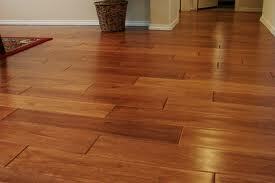 Most of these chemicals are specifically designed to get rid of stains and dirt in carpet and not hardwood flooring. You run the risk of causing permanent damage to your wooden floors with chemical sprays and other cleaning solutions. You can vacuum your floors as normal, as this will get rid of the dust and dirt that builds up over time just as effectively. However, never drag or pull furnishings around the room as this can quite easily scratch and gouge the wooden surface. If you don’t have people to call on to lift your furnishings, simply put the furniture on small pieces of fabric so that they can slide around without causing damage. One of the biggest mistakes people make when thoroughly cleaning their wooden flooring is using water during the mopping process. If you haven’t yet given your wooden flooring a surface-sealed finish, you run the risk of causing permanent damage with water. Making hardwood flooring water-resistant with products such as polyurethane is essential if you plan on using a mop in the future. As we mentioned earlier, vacuuming is the preferred method to use when cleaning wooden floors. Whilst you might be tempted to go for a standard indoor broom to collect the dust, using a handheld vacuum instead can help you target the gaps that often appear with natural floorboards. Finally, it helps if a lot if you don’t wear shoes or sportswear such as football boots indoors, as these can damage the surface of the wood, whilst pets with large claws can also contribute to scratches on the surface of wooden flooring. If you need expert help keeping your floors clean then get in touch with Apple Clean and we can offer you the benefit of over 25 years of experience.